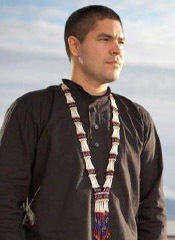 I am Neetsaii Gwich’in, Koyukon, and Jewish from a small mountain village in Northeast Alaska called Vashraii K’oo. From a young age I chose to follow a path that has challenged me to look within myself and into history, so that we can build something healthier for the future generations. Along the way I have served as the Chief of my tribe, founder of several non-profit service organizations, and have facilitated gatherings around the world. My wife Enei Begaye Peter is Navajo from Shonto, Arizona. We support culturally based leadership and sustainability projects in Alaska and the Southwest through the Indigenous Leadership Institute and the Black Mesa Water Coalition. I am an owner in two family businesses, an Alaska based consulting firm called Gwanzhii and an eco-friendly t-shirt screen printing company called Nomadic Stars. I also host and write at the Tundra Post.